Two interlocked triangles, one point up, one point down, form the Star of David in this lovely bronze necklace. The Star of David is a symbol commonly associated with Judaism made of 2 equilateral triangles, one pointing up and the other pointing down. 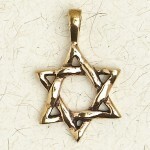 It Hebrew, it is called Magen David ("Shield of David") a symbol of protection. It is also often associated with the Kaballah and also represents the esoteric maxim "As Above, So Below". Here the sacred symbol is hand made in solid bronze with attached bail. It measures 1 inch tall, 3/4 inch wide and comes on a 33 inch long black neck cord with story card. Item Number: NV-BZP-365 | Approximate Size (Inches): 0.75 wide x 0.02 deep x 1.00 high | Approximate Shipping Weight: 0.25 lbs.